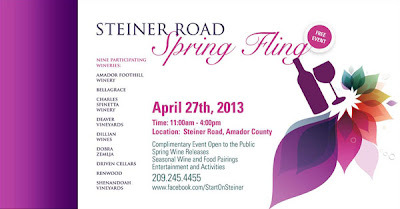 PLYMOUTH, CA – March 22, 2013 – Everyone is invited to Enjoy All That is Spring with the Wineries of Steiner Road on Sat., April 27, 2013 11am-4 pm. This FREE Food and Wine event will delight the senses. Guests can stroll through the beautiful grounds of nine wineries, taste a variety of wines, listen to live music, experience all the blooming flowers and enjoy special treats. Taste some small bites of spring lamb sausage, turkey and vegetable wraps, asparagus bruschetta, apricot pastry wrapped baked brie, wood fired pizza, Italian fare appetizers, tapenade cheese spread and crostini, tri-tip sliders, and artisan cheese and wine parings!! Steiner Road - in the heart of the picturesque Shenandoah Valley, off Highway 16 - is home to many award-winning wineries. Just 45 minutes from Sacramento and 2 hours from Reno, Tahoe and the Bay Area, it is an easy day trip to the friendly Amador County Wine Country. Visitors also can enter to win two tickets to the sold out Barbera Festival June 8th, 2013 by visiting at least 5 of the 9 participating Steiner Road wineries: Shenandoah Vineyards, Amador Foothill, Bella Grace, Deaver Vineyards, Driven, Dillian, Renwood, Charles Spinetta and Dobra Zemlja. Steiner Road Wineries, off Shenandoah Road (Hwy. E-16), east of Plymouth, CA, in Amador County. Questions: Contact Camille Sobon, (209) 245-4455. 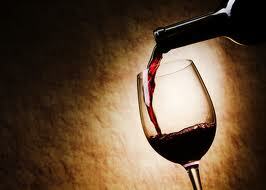 The wineries of Steiner Road also have a new Facebook page. Connect with them by clicking "like" here.